What are the Census interaction data? They are relatively little known and are under-used. They are the migration, journey to work and journey to school data. Some information about these topics are available via the standard area statistics, so what is different about these? 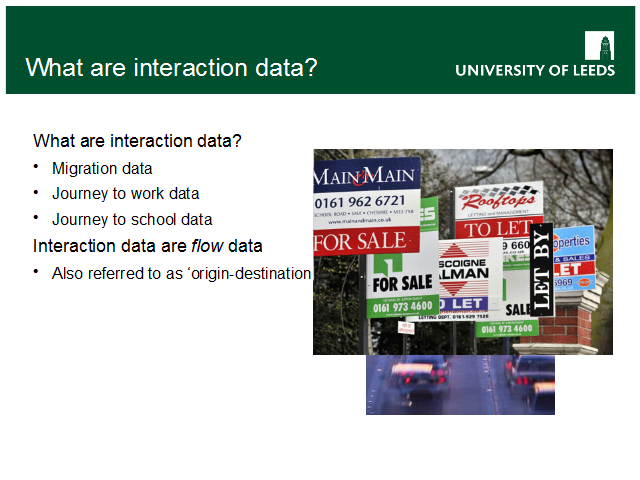 The interaction data are flow data that link an origin and a destination. Whereas the area statistics include some aggregate information about all people migrating to or from an area, the interaction data allow each separate origin and destination to identified.